Plantation Shutters add charm and protection to your windows, French doors, sliding doors, and to other areas of your home or business. 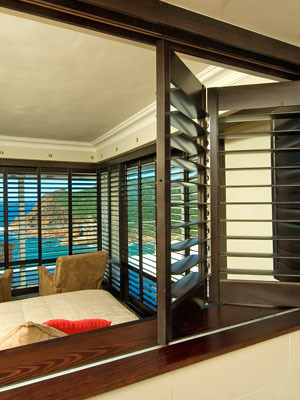 When plantation shutters are closed, they offer privacy, protection and warmth. When opened, they induce a sense of spaciousness while at the same time providing a breathtaking view of the outside. Interior shutters are fitted to the inside of your window, swinging inwards to allow you to open and shut the window or to let light in. They are generally made with slats, also known as louvres, that can be opened or closed to control the amount of light you let into your home, as well as the amount of airflow. Shutters designed for the interior of a home can be made of synthetic materials, or from a wide variety of timbers which can be stained or painted to suit any decor. The best material depends on the use and position within the home. Synthetic materials, for example, are often chosen for bathrooms or other wet areas, where humidity and moisture could affect some wooden varieties. 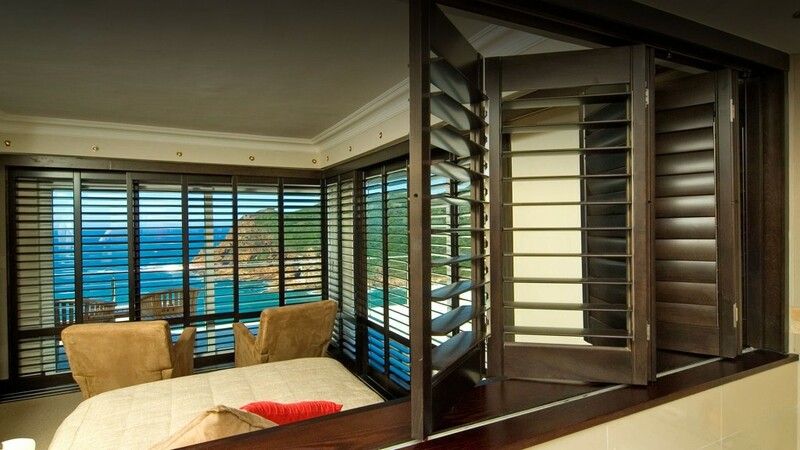 The plantation shutters are coated with a UV protective wood stain or paint finish to prevent fading and warping. Whether you choose synthetic or wooden shutters, there is no doubt that the simplistic but charming style offered by plantation shutters compliments sophisticated and minimalistic design. Plantation shutters can be divided into either two or three panels. This way, they can fold back into the window’s recess. They can also open out in a way that they fully cover the entire window. Normandy wood, from the Phoenix Tree, is a hardwood with natural qualities that make it ideal for shutters and blinds. In its natural state, Normandy is a very even-coloured wood – perfect for staining. Woodlore® is a strong, long-lasting wood-composite product, consisting of a Medium Density Fibreboard (MDF) core. They are extremely strong, durable shutters, even more hardy than those made of solid wood. Woodbury is a man-made product developed for use in the moisture zones of your house. It consists of a timber core, encased in a synthetic product called ABS. They are ideal for kitchens, bathrooms and laundries. Western Red Cedar is a softwood from the Cypress family of trees. It is available in two colour ranges: light to medium and medium to dark. These colour ranges offer a wide variety of tones, from milky white to chocolate brown. 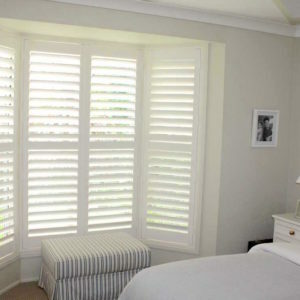 Can Plantation Shutters Be Used In The Bedroom? Can Wooden Shutters Be Used For Adding Privacy To Doors? They can be custom designed to fit virtually any window or door, including arched or angled windows and doors, glass roofs and conservatories, and they can be fitted to partially or fully cover the window or door. They allow the homeowner to control the amount of light and airflow in the room by changing the angle of the louvres, giving control over a room’s ambience. The louvres can redirect ultraviolet rays away from furniture, decorative fabrics and floor surfaces, protecting them from damage and fading. They can provide protection against the sun and heat during the summer, while allowing circulation of air, reducing air conditioning use and increasing comfort. Shutters insulated your room in winter by creating a timber barrier – keeping out the cold and saving you money on heating! They provide sound insulation, reducing noise, improving sleep and increasing the comfort of your home. They provide just the right amount of privacy and security you desire, as you can choose to completely or partially close them. Shutters are cost effective and durable, and they are a great investment for your home. 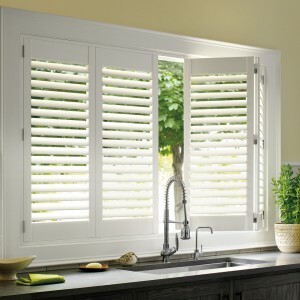 Not only do shutters have a clean look, they are also very easy to keep clean, simply by wiping them down. They are very easy to customize to the size and style of your window. You can choose your slat size, colour and panel design. We choose only the highest quality brands for our customers, and when it comes to shutters, Norman is the name to trust. The Norman brand uses a meticulous process to achieve a stylish, durable finish on its plantation shutters. This involves multiple sequences of sanding, with progressively finer sandpaper, to open the pores of the wood. The plantation shutters are then smoothed and finely coated with several layers of high-quality stain or paint, ensuring a silky, lustrous finish. Some shutter manufacturers fall down on quality by using semi-custom, pre-painted components, to reduce delivery times. Others endeavour to make custom blinds and shutters, but use insufficient sanding or coating. Such shortcuts only lead to compromised quality. In contrast, the labour-intensive process used by Norman shutters achieves our unique translucent, deep finish. Follow the links below to learn more about the Norman shutters available from Complete Blinds Sydney. Have you thought about automated shutters? Read about our motorisation technology. Shutters are not just for windows! French door and sliding doors can be mounted with interior shutters too, providing the same style, shade and privacy. Plantation shutters for sliding doors add a stylish and contemporary look. They also protect your doors from glass breakage! To allow access in and out of the doors, the shutters can be folded or slid neatly to the side. When closed they allow control over the light in the room, and provide full privacy when needed. Plantation shutters are also commonly installed over French doors because they avoid the impact that blinds create when the doors are opened and closed. Wooden plantation shutters mounted over French doors add a classic finishing touch to the design of the house. Plantation shutters are attractive, durable and long-lasting. They are ideal for people who suffer from allergies as they do not accumulate as much dirt and dust as blinds and fabric curtains do. In fact, an accumulation of dirt and dust can make blinds and curtains an ideal place for dust mites. Whether your shutters are made of wood or synthetic materials, they are very easy to keep clean and to maintain. Simply give them a light vacuum using the soft brush accessory on your vacuum cleaner to remove excess dust. For a more thorough clean, perhaps once a month or so, use a cloth and wipe the slats from top to bottom to remove dust from crevices. For painted or synthetic shutters, use a cloth and soapy water, then dry down with a soft towel. Wooden shutters, however, are best cleaned with a cloth sprayed with wood polish, rather than soapy water, which can cause damage to the wood. If you have children or active pets in the house, there is no need to worry about damaged or cracked slats, as they are easy to replace. 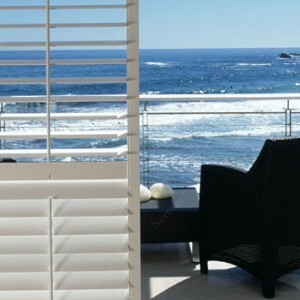 Complete Blinds are one of Sydney’s best suppliers of high-quality shutters. 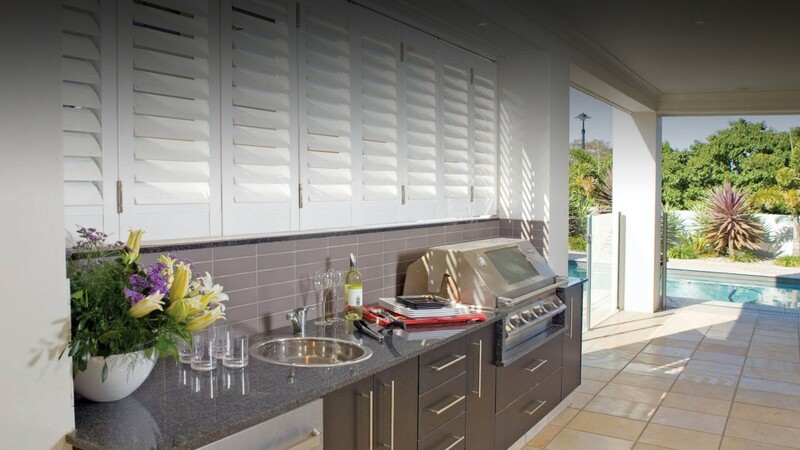 Our plantation shutters are made from resilient, high-quality materials engineered to provide the best shading solution for the Australian climate. While the cost of plantation shutters can very, we offer some of the most affordable door and window shutters on the market – without compromising on quality. We also have shutter sales at times, so stay in touch for a chance to benefit from some quality products at amazing prices. Remember, if you’re searching for quality plantation shutters or plantation shutters prices in Sydney, contact us at Complete Blinds. What are Interior Plantation Shutters? 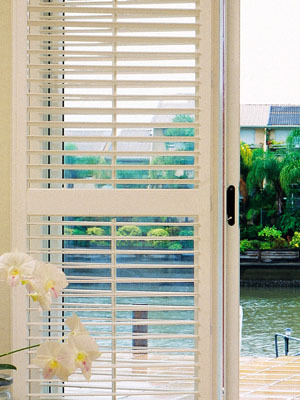 Plantation shutters are louvred panels which are usually fixed internally over doors and windows. These shutters trace their origin in the West Indies and America before the American Civil War. Yes. Unlike blinds, shutters don’t have any cords for children to play with. Therefore, they are perfect for nurseries and children rooms. Will my shutters require maintenance of any kind? Except for the occasional dusting, our shutters shouldn’t need repainting or maintenance of any kind for many years. How do I determine the best louvre size for my new shutters? The size of your louvres depends on the size of your windows and the level of privacy you require. Large louvre sizes allow more light in and offer less privacy than smaller louvre sizes. My new shutters are not holding their position, do I replace them? When this happens, find the hole with a screw on the side panel. This hole is commonly referred to as the tension screw. Once you find it tighten it gently with a screwdriver. The tension will be adjusted on your louvres and they will hold their position perfectly. Can I have my shutters customized to colours of my choice? Yes, you can. Complete Blinds offer a wide range with an option to customize your colours. We can match any popular paint brand or a sample provided by you. I want to make my room dark, will plantation shutters help? We can help you customize your shutters to provide maximal darkness. Normally, light colour paints and large louvers help reflect light into a room while darker shades and smaller louvers limit the amount of light entering the room. Why should you choose Complete Blinds when you wish to buy shutters? 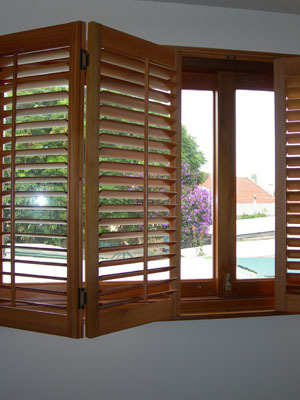 We supply the highest quality shutters in Sydney. We understand that shutters are a very important addition to your home and we pride ourselves on matching the quality of our shutters with excellent customer services. We will keep you updated at every step, and we value your feedback before and after installation. 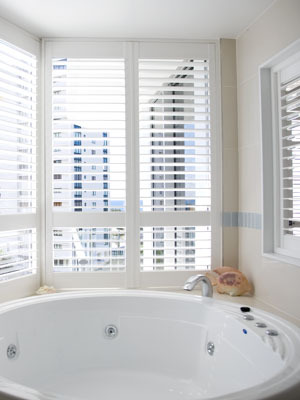 Complete Blinds are Your Suppliers of Plantation Shutters. We pride ourselves in offering the highest-quality shutters, coupled with dedicated client care. Contact us online or call 02 8824 7975 today!